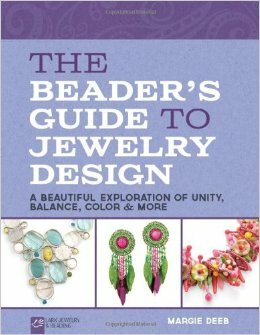 Margie Deeb's long-anticipated new book, The Beader's Guide to Jewelry Design, is finally here! Worth the wait? Oh, yeah. Published by Lark Books, this volume was written to help you take the next step in designing your own pieces, no matter where you happen to be along that magical journey. Never designed your own? Here's how to start. Been designing for awhile? Here's how to get better. Been designing a long time. Here are yet new avenues to explore. Unity - The overall impact of your piece. Helps you answer the question, How much repetition is enough and what form should it take? Focal Point - How to move the viewer's eye where you want it to go. Balance - Can be achieved by symmetrical or asymmetrical design. A lot of attention is given to how to achieve asymmetrical balance since it is more difficult. Movement - Physical and/or intangible. Extremely important to good design. Movement can be implied through light, pattern, texture, and color. Shape - The first thing someone notices from a distance. Color - The most important element for initial impact. The remainder of the book focuses on jewelry design and the body, considering styles which go best with body types, face shapes, necklines, etc. This is a particularly helpful section if you are going to design for other people, since it can't just be about what you like in those circumstances. Lark Books has started publishing a multi-part interview with Margie, which I know you're going to want to follow too. Part one is at the link above, and for the rest you can just search on her name.